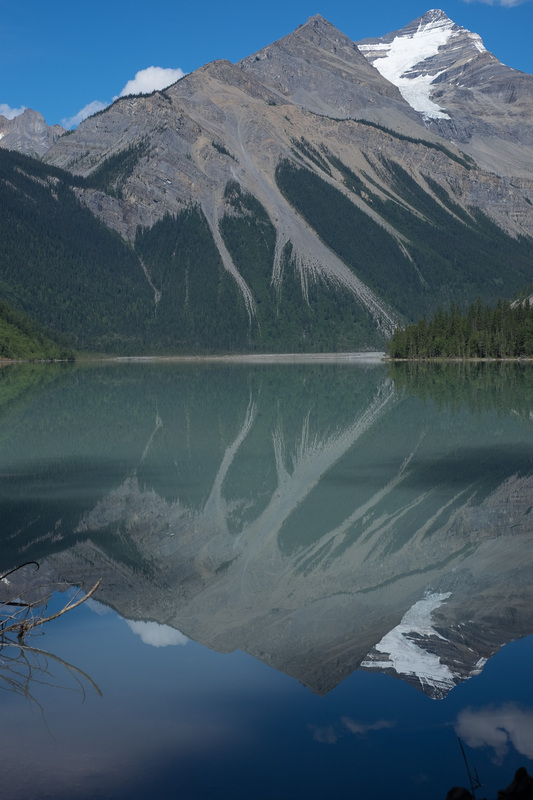 My buddy Scott at Porcelain Rocket has been several times to Fish Lakes, up the Mosquito Creek trail on the Icefields Parkway in Banff National park. He has consistently talked about it being one of the best hikes he has been on. We have been watching for vacancies in the campground that lined up with potential vacation days for a couple of years now, and this year we had the opportunity to try it. Our first day was a bit of a warm-up with a short 5km hike to the Mosquito Creek backcountry campsite. It was pleasantly tucked into the woods near the creek, and the hike was easy, if a little muddy from all the rain we have had this summer. There are occasionally horses on the trail, so the trail does have numerous potholes that drain poorly. The Perseid meteor shower was due to peak on our first night out, but there were some fairly persistent clouds that prevented us from getting much of a view of them. Fiona worked herself up over them enough that she woke up a couple of times in the night to ask me to check for “rocks falling in the sky”. Though we were under the tarp as usual, we had the bug net deployed, so I needed to move quite a bit further than usual to see the sky. Our second day was much more ambitious, 13km over North Molar Pass. 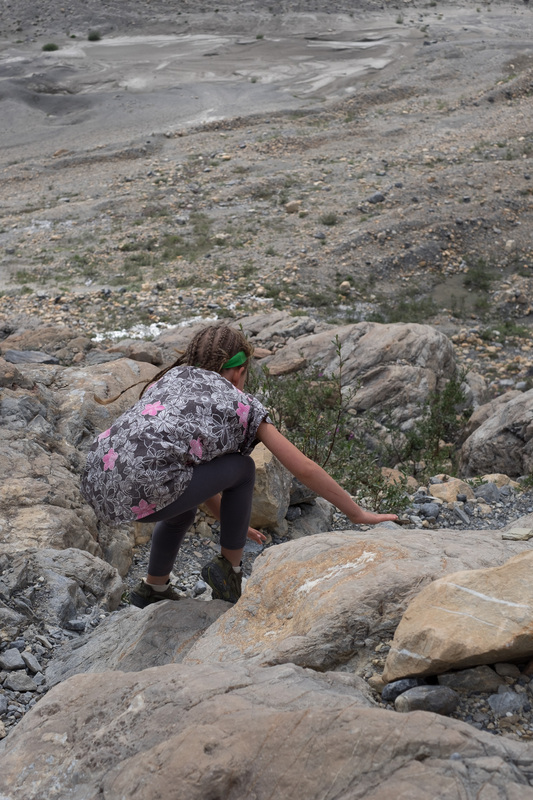 The kids have learned to be leery of the word “pass” since it sometimes means really steep climbing and equally steep descending on the far side. After the first couple of kilometres of hiking, we emerged into a gorgeous alpine meadow with views of mountains all around. The meadow itself would have been enough to make most hikes worthwhile, but it turned out that this was only the opening act of a very impressive show. The meadow went on for a couple of kilometres, and then gave way to the climb of the pass itself. The hike wasn’t easy, but at the same time it was not as arduous as many of the passes we have hiked this summer. But what a view! It was spectacular on the way up, even better at the summit, and continued to amaze on the way down. I know why people come here. It was only a few downhill kilometres to the Fish Lakes campground on the shore of upper Fish Lake. We got a laugh when we spotted the “no fishing” signs. The kids really enjoyed the irony. We set up our mid and our tarp in a couple of the cleared spots in the trees and started on making dinner. As per usual, we met a few friendly and interesting campers. I increasingly believe the idea that time spent in the backcountry improves your sanity. 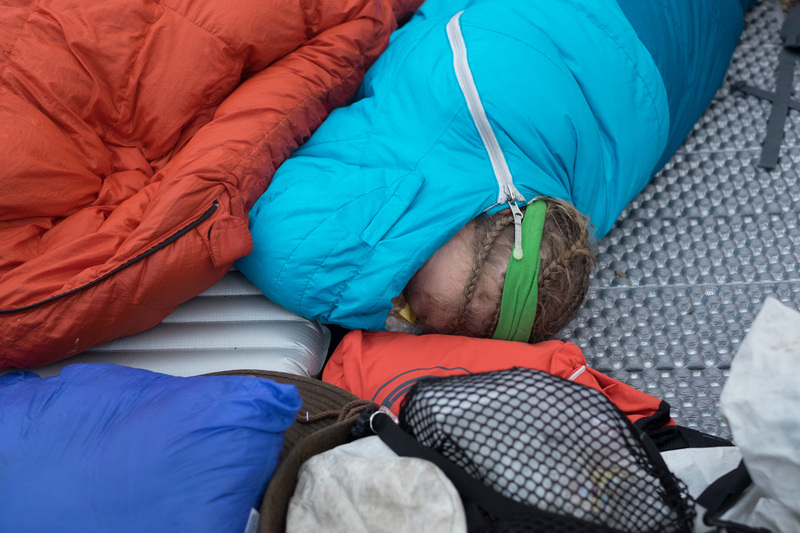 It seems that the people who spend the most time in the backcountry are the easiest to get along with. Fish Lakes has a number of options for dayhikes from the campground. Armed with a vague description and no map, we decided to try Pipestone Pass, with the idea that we would turn back if it turned out to be too far (I have a pretty good map collection, but not this one). After passing the rangers’ cabin a kilometre or so down the trail from the campground, we followed the sign to Pipestone Pass. After a series of switchbacks through forest, we were ejected into a series of alpine meadows with lakes and mountains and glaciers to look at. We hiked on through the day in a wonderland of flowers and lakes that were breathtaking. The recent rains meant that the trail was quite wet and there were a couple of creek and bog crossings where we took off our shoes to cross. Neither this, nor the “horsed ” trail could dampen our enthusiasm for the surrounding scenes. I did have to break out some stories on the trail to distract Fiona from working up to a trail conniption. I usually tell lesser known sequels to “The Boy Who Cried Wolf”. This time, it was one about the boy joining a civil service construction union. It took 4 guys, seven weeks to change a lightbulb – only a slight exaggeration. The stories are based around being long, literary merit is not given the least consideration. As we came to the summit of the pass, we were a little disappointed when the trail died out suddenly. Only later, when we had read some trail descriptions. did we realize that this is how the trail goes. 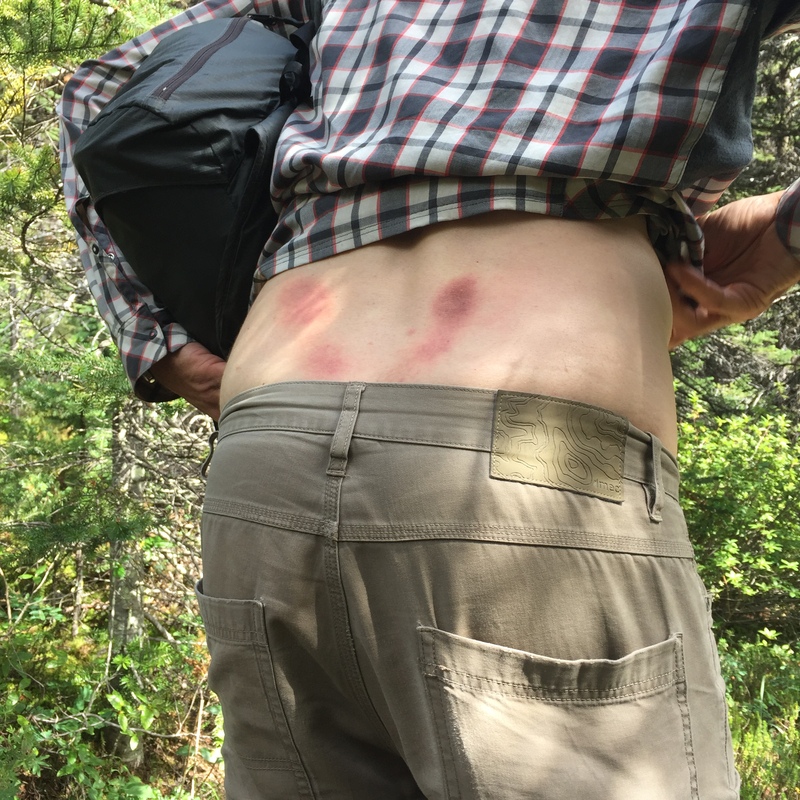 A bit of bushwhacking (rockwhacking?) would have gotten us through the pass to see the far side unimpeded. As it was, we had spent more time and gone further than we had intended. Our one-way distance was around 11.5 km and we still had the return journey to make. The time flew on our way back and soon we were back at the campsite to spend another night. 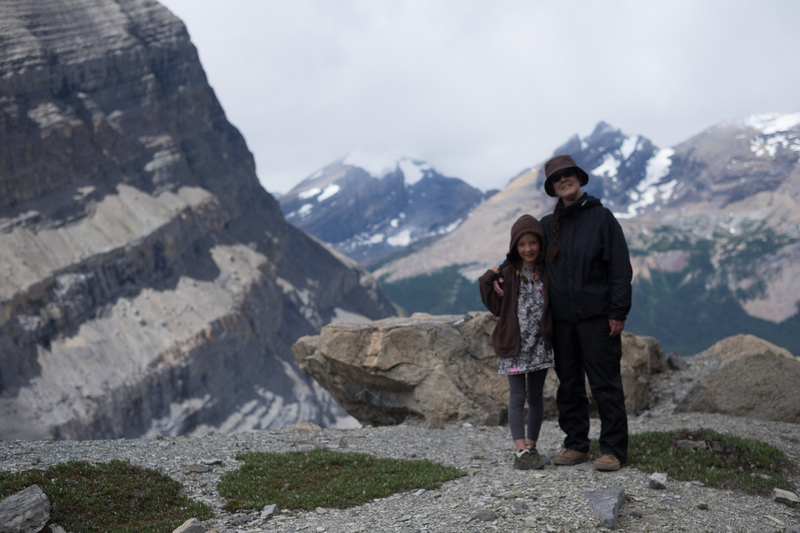 The 8-year-old and the 48-year-old were pretty tired, but the hike was well worth it. It was also our fancy dinner night and we had coconut couscous lentil stew, it was delicious, even though I added a little too much water to the lentil part of it. We cook up the lentil and spice part ahead of the trip and then dehydrate it since lentils cook very slowly at high altitude. Of course when I woke up at 6 on Sunday morning, it was starting to rain. A thorough look at the sky showed me cloud from horizon to horizon, with a thunderstorm passing just the other side of the lake. 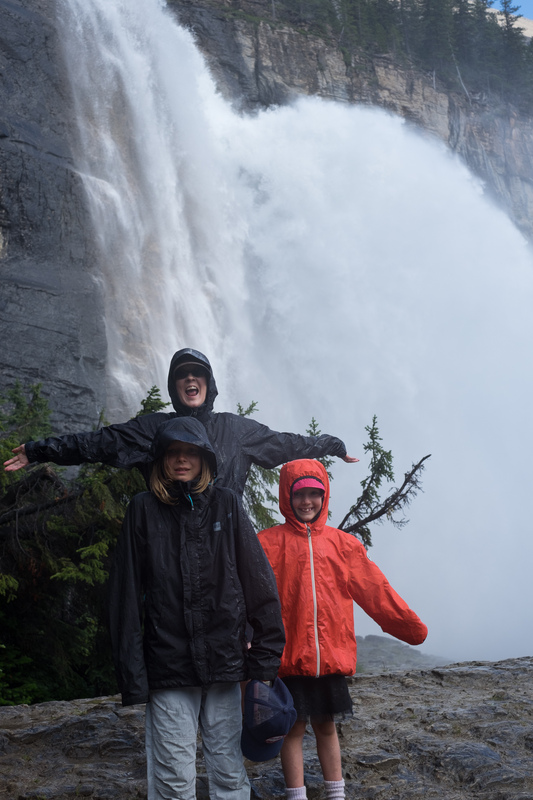 It was clear to me that we were going to be packing up and hiking out in pouring rain again. Just after our first coffee, I was proven wrong when the clouds moved off leaving a sunny sky in their wake. The hike out was actually very pleasant, other than the trail being somewhat wetter than when we hiked in. We did the entire 18km out in one day, with a couple of lunch and snack breaks. We had originally planned to do a bike trip – this is a bikepacking blog after all. Since the bike trail was on fire at the time, we decided to choose an alternate trip. It ended up being a hike for a variety of forest fire reasons, and since mount Assiniboine did not have reservation system it was one of the few things that we wanted to do that wasn’t booked. The way that we wanted to do the trail was starting from sunshine Meadows. The best way to start the hike was to take the shuttle bus up from the Sunshine parking lot and begin hiking at the ski resort. 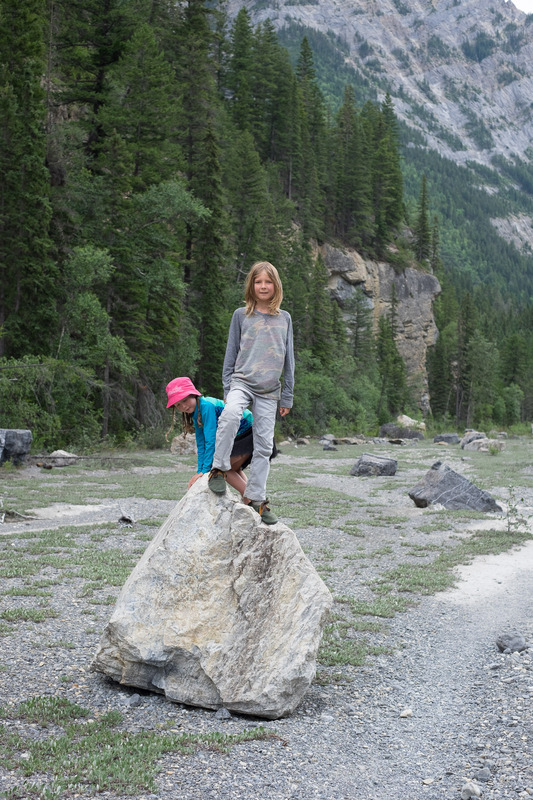 So that we could take an early shuttle and begin hiking early, we decided to spend the night at one of the car camping campgrounds around Banff. The only one that had space when we were reserving at the last minute was Tunnel mountain. The on-line reservation system was very clear that there were no parties allowed after 11, not even campfires and conversations. We took this as a good sign since we intended to sleep during those hours. We should have been concerned when we got to the campground and of the 6 vacant campsites around us, 5 had smouldering fires left by previous occupants. We became more concerned when we saw that the occupants of the adjacent site were rowdy hipsters. We went to bed at around 9:30 so that we could get up early in the morning to drive to Sunshine in time to catch our 10AM shuttle. When Tania and I got up to go to the washroom at 11PM, the hipsters had just returned from town. They were loud and drunk, but we assumed they were going to bed. There was no such luck. The party lasted until well after 3:30, with loud shouting, arguing and laughing without concern for the other campground denizens. Not that it mattered since in the years since we spent time in car campgrounds it has become acceptable to have a car that honks the horn when you lock and unlock it and to lock and unlock it many times per night. I am sure that no more than 30 seconds went by all night without a car honking and no more than 5 minutes went by without a car alarm going off. The trains going by were tranquil by comparison. Fiona got a few hours of sleep, Tania and I got a few minutes between us and Tadhg may have been awake the entire night. The following morning our usual jitters about starting a long hike were calmed by the knowledge that it couldn’t possibly be worse than Tunnel Mountain campground. We had been through hell and there was nowhere worse to go. We were early enough that our preparation for the bus ride was casual and calm. We all had our packs sorted and ready to go since we didn’t unpack them at all the night before. I laid out the car camping tents and bags in the back of the car so they would dry and double checked everything in my pack. The bus ride itself was a little dull, as bus rides tend to be, I was glad to be riding rather than hiking the relentless uphill grade to the ski village. It doesn’t take long from the ski village to go from beautiful to stunning. The ski lift infrastructure may not be a wilderness experience, but the surrounding mountains are still beautiful, ranging from lush to stark. Our weather was close to ideal, cool enough for hiking, warm enough to not have to bundle up. We hiked along the trail past gorgeous mountains, over passes and through valleys. The hike to Assiniboine is well recognized as one of the most scenic in the world and it lives up to the hype. The kids made us stop a few times for snacks and so they could sketch mountains and write in their books. In spite of our fatigue, we were happy and filled with wonder at the scene surrounding us. Our final descent of the day was a tough one. The slope was the steepest we would see, and our packs were loaded with all the food for the entire week. 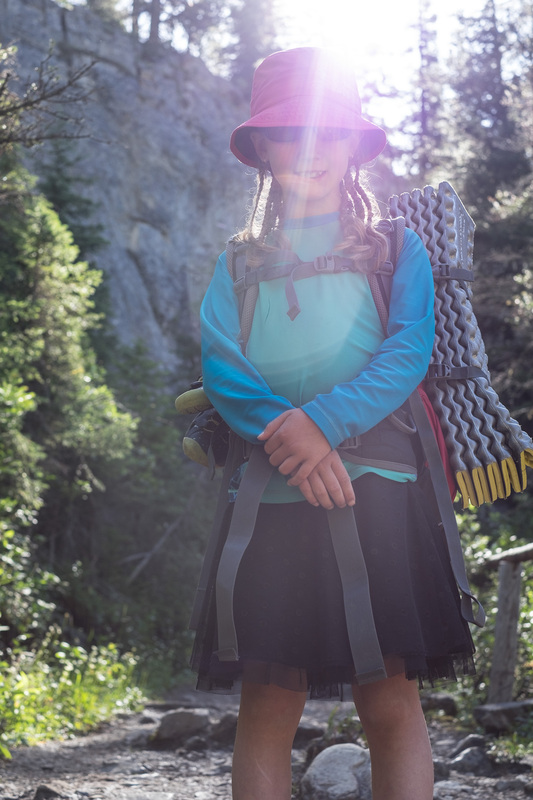 Fiona had saved her trail conniption until the last 500m to the campground at porcupine creek, but even that couldn’t dampen our spirits in such a wonderful spot. 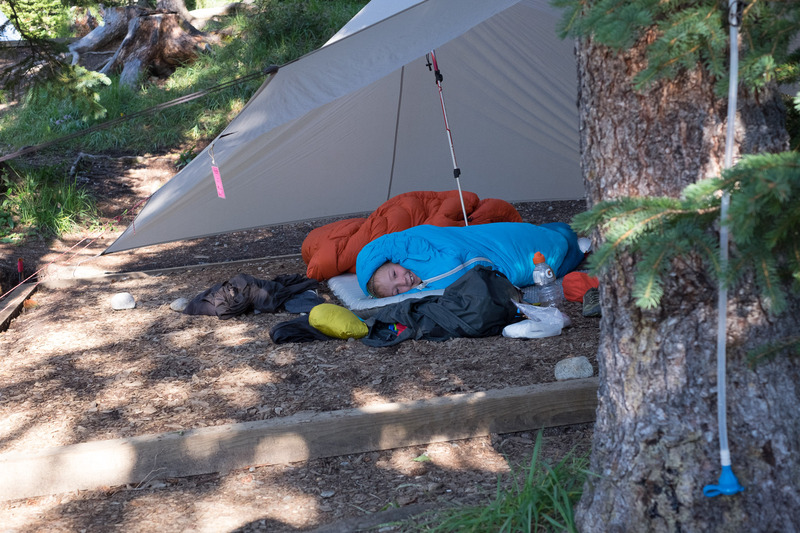 Sleep came easily to us after our long day of hiking and we slumbered peacefully in the mountain air with the faint scent of campfire smoke. 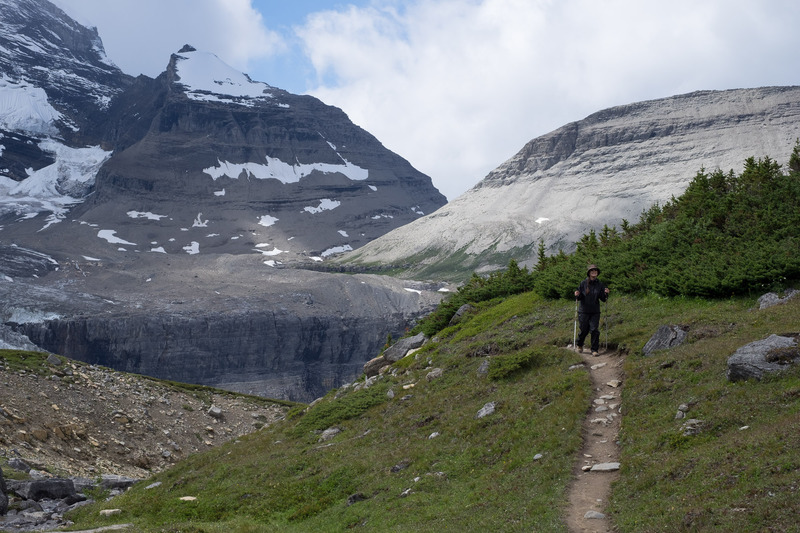 We had been on the Berg Lake trail in Mount Robson BC Provincial Park before in 2013 and remembered it as a series of beautiful places, any one of which could be a great trail on its own. When Tania suggested back in January that we make reservations to go back, I was eager. 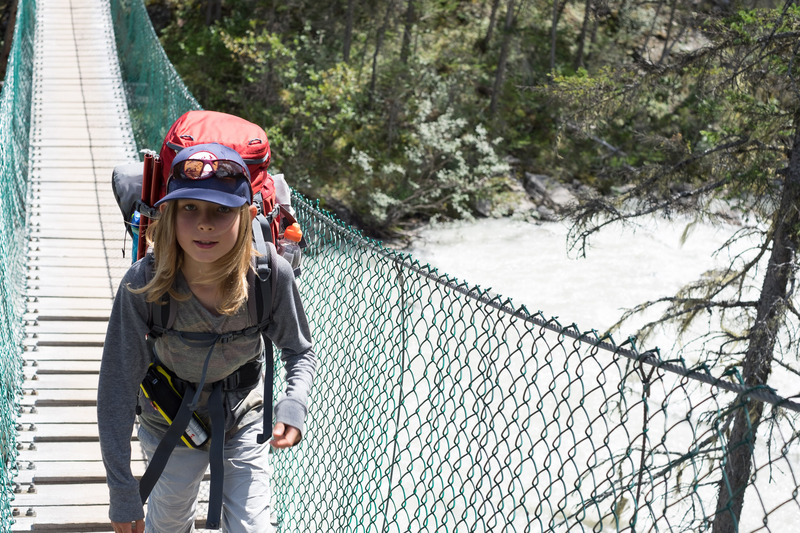 The kids now consistently carry all their personal clothes and gear on all our hiking trips, and each year they get stronger and more able to hike long distances. Our longest day with packs on was to be 12km on our second day which seemed difficult but achievable . Before we left home, I weighed the packs and the 3 that weren’t mine weighed around 25% of their owners’ body weights. My pack was 40% of my weight and then I added 2 litres of water, 1.5 litres of fuel and a 6 pack of beer. my best guess is that I was carrying 88 pounds when we left the parking lot. Our first day hiking was the easier of the hike in days. 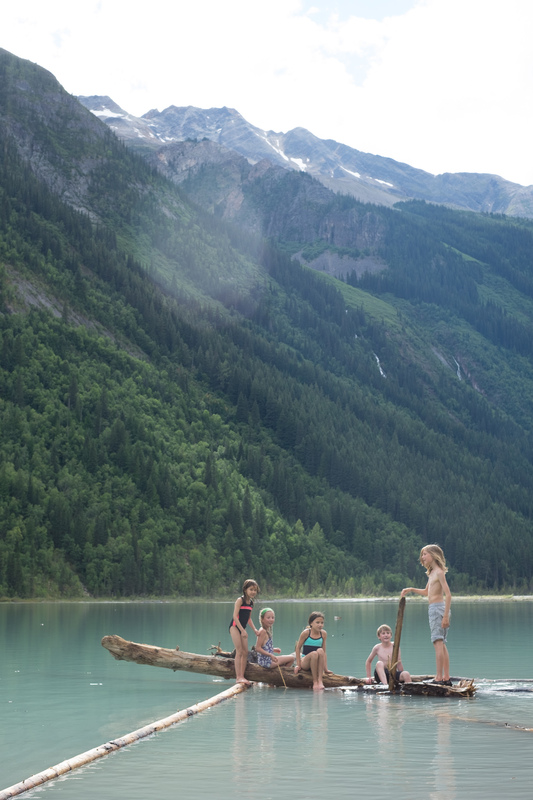 A hike through rain forest brought us to Kinney Lake. We only stopped once, just after the 2km mark for me to run back to the car and get my camera. 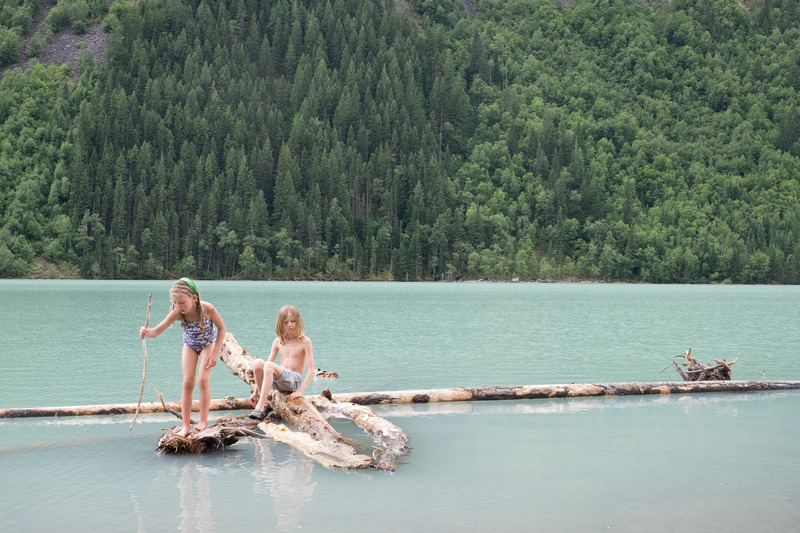 Kinney Lake is absolutely beautiful with its green colour and backdrop of mountains. We had considered leaving a food drop there for the trip out, but the single bear locker did not leave enough room for our extra food and all of the overnight campers in this busy campground. 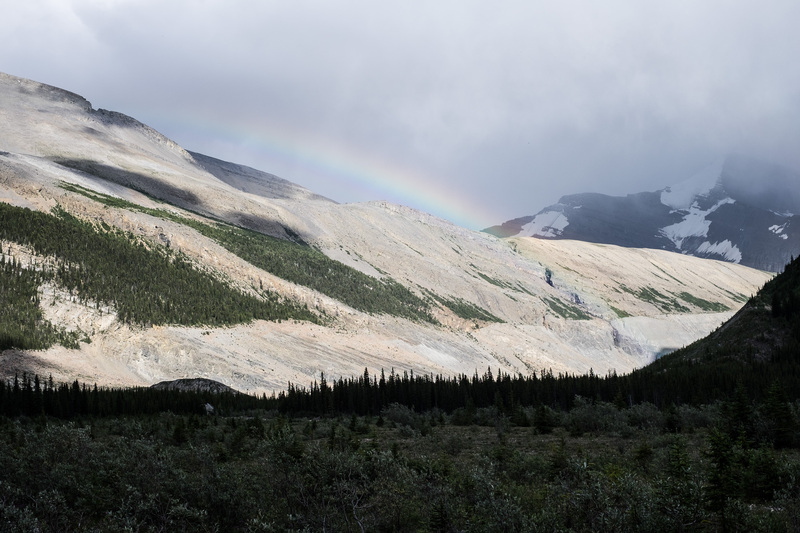 We continued our journey toward Whitehorn, our destination for the first night. 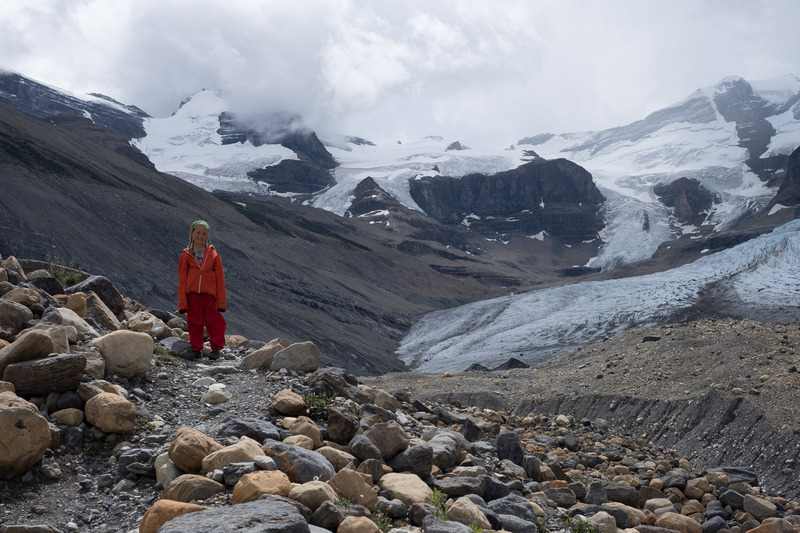 Though I was struggling with the oppressive weight on my back, the valley leading up to Whitehorn campground is a stunning sight and helped take my mind off the pressure on my back. 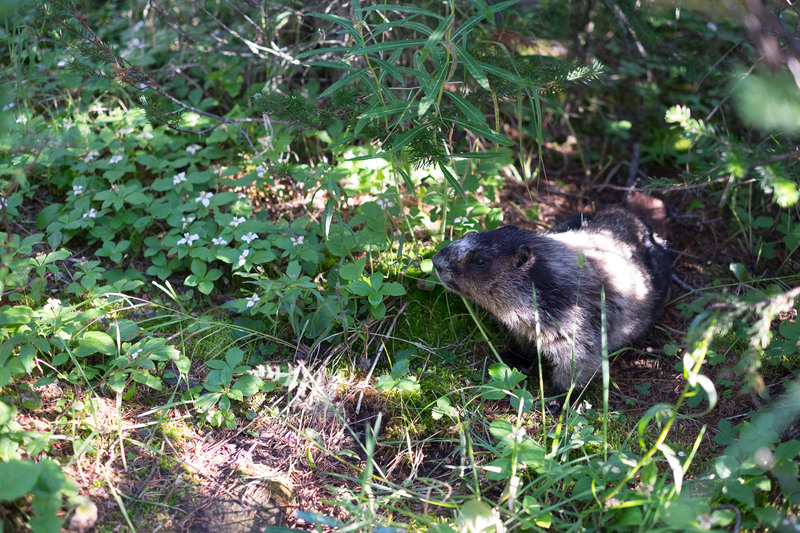 As is her habit, Fiona made friends with everyone on the trail. People often call her a “good little hiker”, but really she is a good hiker by any standards. She had her usual trail conniption, but she was just as perky at the end of the day as at the beginning. 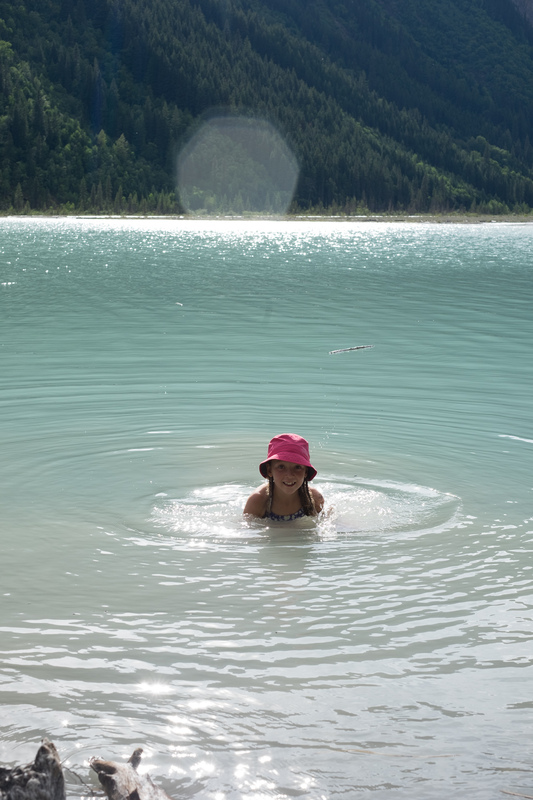 As soon as we got to Whitehorn campground, she changed into her swim suit and went to play in the glacial river. The weather was a little cool at only around 15ºC and it had rained in several previous days, so I was not completely surprised that someone had lit an emergency fire in the stove at the Whitehorn picnic shelter. I didn’t see anyone obviously hypothermic, but there were a few pieces of gear drying on lines near the stove. Now, before going on the Berg Lake trail, folks are asked to watch a video showing the trail rules. These rules are generally obvious, such as no stereos, share the shelters and store food in the bear lockers, as well there are some other rules like no fires except in emergencies. As I was cooking dinner, there was less and less gear hanging to dry by the stove, and it became clear that the family that were stocking the fire were the ones occupying 2 tables in the busy shelter, listening to their stereo (and sometimes singing) and not drying any gear (their gear was easy to spot, all 7 of them wore various camouflage patterns from shoes to hats). In to morning, they were chopping wood at 5AM and had the stove stoked up by the time I got there to make coffee at 5:30. They were complaining about the rodents that had eaten all the food in their daughters’ packs (shouldn’t that have been in a bear locker?). By the time we left the campground at 10AM, they had their gear spread on all 4 of the tables while people were cooking on the ground outside. Fortunately they were on their way out since nothing spoils a trip like having to camp with assholes. Our second day included the 4km long 600m climb that constitutes the hard part of the trail. While stunningly beautiful, the beauty is somewhat diminished when carrying 80 pounds on your back. Just putting my pack on enraged the raw sores I had developed the day before, but I staggered up the hill, pausing frequently to rest my legs. When we reached Emperor Falls campground, I needed a rest. We still had 7km to hike but hardly any more elevation gain. With a short rest break at the Marmot campground, I plodded the rest of the way to our campsite at Rearguard. 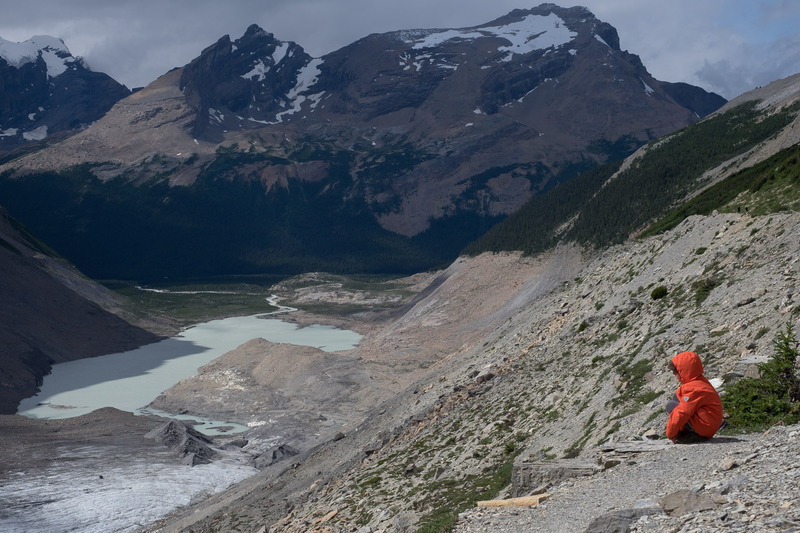 Rearguard is the smallest of the Berg Lake trail campsites with only 5 tent pads, but it has a great view of Rearguard mountain, as well as some view of Berg Lake and of the Robson Glacier. It was to be our home for 3 nights. The bruise/raw part of my back and hips makes a smiley face. 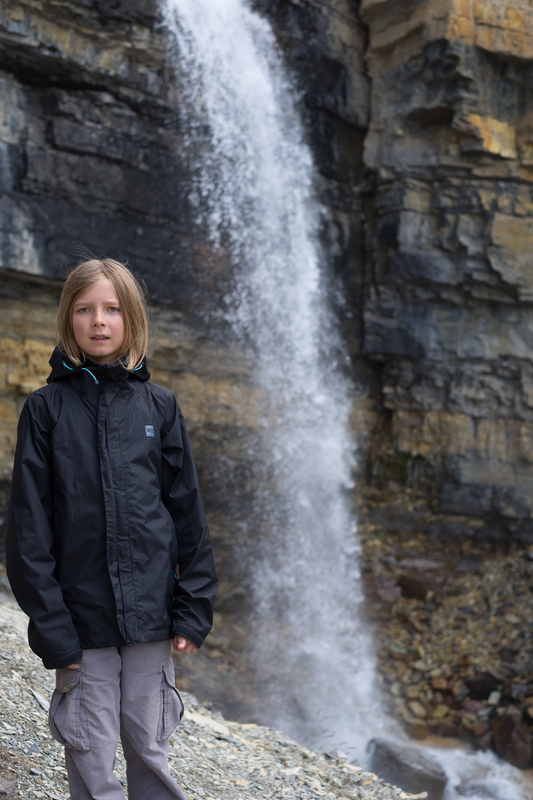 One of the best parts of the Berg Lake trail is that there are many day hikes from the Berg Lake campgrounds that offer even more to see in addition to the waterfalls, Berg Lake and the majestic Mount Robson. We headed out on our third day to hike Toboggan Falls. We had been up these previously, but the trail is rewarding and the falls are unique in their unusual erosion patterns. It was raining intermittently, but never too much, and we seemed to never need our raincoats for more than 5 minutes or so at a time. By the time we got to the cave at the top, it was clear that we wanted to do more, so we decided to add on the Mumm Basin trail to make it a loop. We were very glad about it when for the first half km of the trail Fiona was completely enchanted by the shale slope landscape. She skipped from rock to rock saying, “Look at this! Look at this!” We couldn’t help but to enjoy the hike. As we rounded the Mumm basin and began to descend, we spotted a marker off the trail that turned out to be a Alberta / BC border marker. The kids were both excited to play the hopping across the provincial border game. The following day we planned to take on snowbird pass – the most strenuous of the day hikes from Berg Lake. 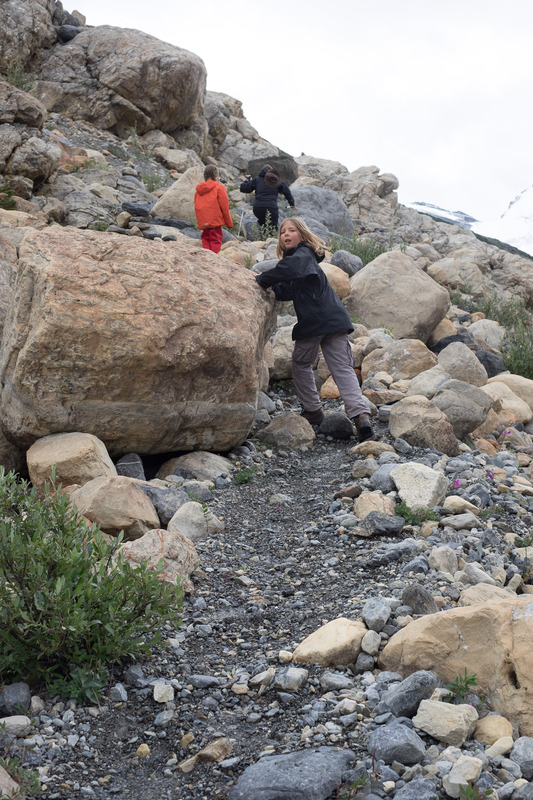 It was definitely a highlight of the trip, though Tania did not like the steepness of the trail as it wound up the glacier debris. The view of the Robson glacier was phenomenal. 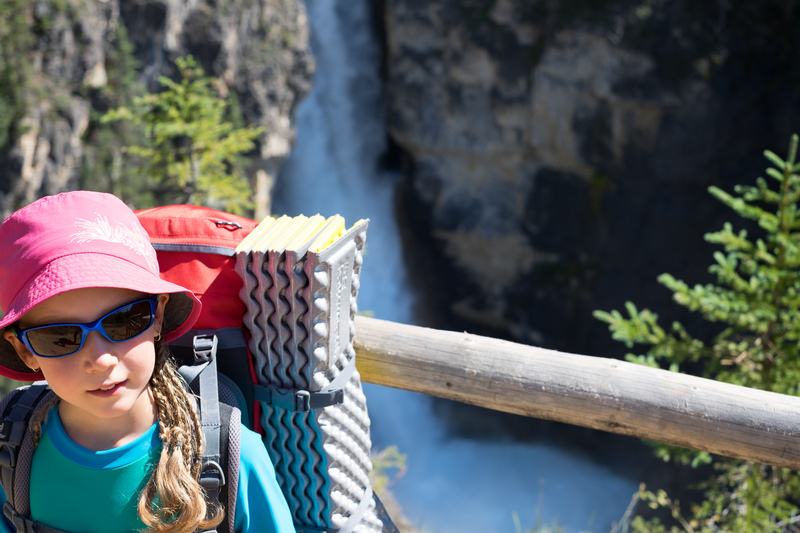 In a fortunate twist of booking, we ended up making our way out with a night at Emperor Falls and two nights at Kinney Lake. 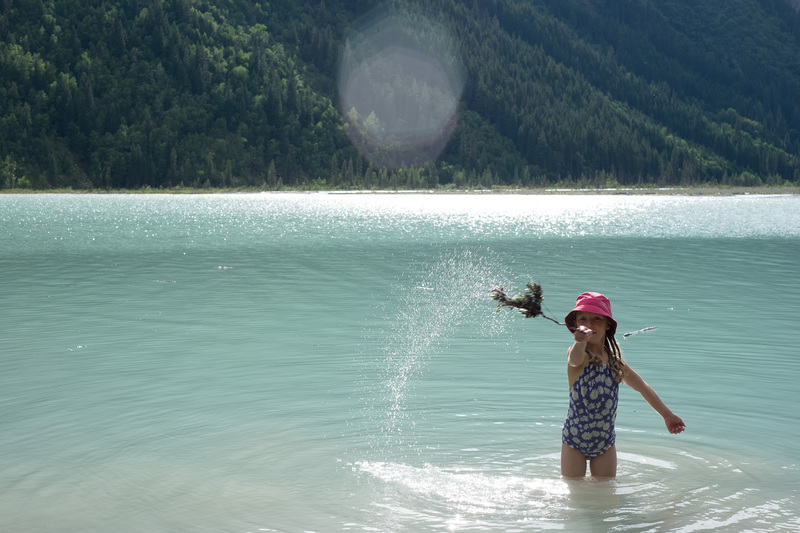 The full day of recovery at Kinney Lake was non-stop fun for the kids and left me well rested for the 7 hour drive home.